They’d never done Palm Sunday like this before. Instead of the usual Sunday morning programming, Wildwood Church of God in Ashland, Kentucky, dared to be different. The church has a history of serving their community but, until Palm Sunday 2018, hadn’t attempted something on such a grand scale. After gathering for a brief worship service, more than 700 people left the church building to go out and be the church in a wide variety of settings. Through 33 different service projects, they would demonstrate the love of Jesus in tangible and meaningful ways to their neighbors. In the end, however, it was clear that the congregation also experienced God’s love on a whole new level. “It’s helped our people to see how, if they open their eyes, there are needs all around them—needs that they can step into and meet in Jesus’ name,” Steve Harris, lead pastor, explains. Pastor Steve notes that serving together brings those who serve closer together. He adds that “it has opened some people’s eyes to just how blessed they are and made them more aware of what is happening in the community they call home.” All unintended consequences, for sure, but welcome blessings, no doubt. The heart of the matter for Wildwood Church of God was what they could do for those around them. 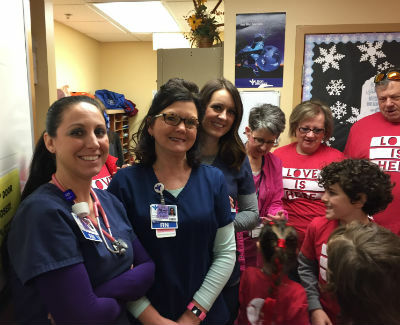 Service project at the hospital. If they hadn’t been in the community on Palm Sunday, they also wouldn’t have had the chance to bless a police officer who had just endured a long and difficult night during which a colleague had been shot at. If they hadn’t been in the community on Palm Sunday, they wouldn’t have had the chance to provide for the needs of a desperately hungry neighbor. Numerous other anecdotes could be told, but the common thread in each one is that God’s love is not only out there somewhere just out of reach; it is here and available to everyone in Ashland and beyond. 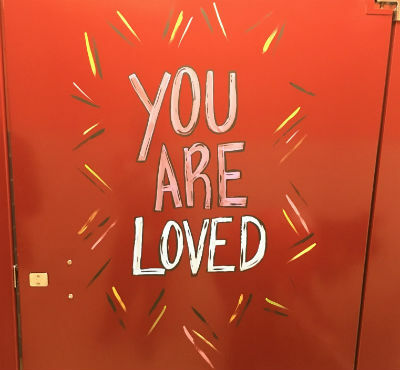 Service project team members were given permission to paint notes of encouragement on the girl’s bathroom stalls at a local school. From painting playground equipment to painting encouraging notes for students, to visiting shut-ins and blessing hospital staff with pizza and snacks, the types of projects covered the community from one end to the other, and included something for everyone to do, regardless of age and physical ability. When Palm Sunday morning came, there wasn’t any need to give instructions or finalize logistics; this detail work was completed in advance of the event. Instead, the worship service, including a focused time of prayer and Communion, served as a spiritual launchpad for all that would be accomplished for the kingdom that day. And, because this event was on a Sunday, it meant two additional blessings worth pointing out. Wildwood Church of God ready to serve Ashland! “Love is Here” was a first for Wildwood Church of God, but it certainly won’t be the last. But even as long-term plans are put on paper for another large-scale day of service, Wildwood Church of God continues to serve as they always do, each week, throughout the year. Love is who they are, it’s what they do, and love is here. In Kentucky, across North America, and around the world, God is on the move in the Church of God. Reach our world. Donate today at give.jesusisthesubject.org. 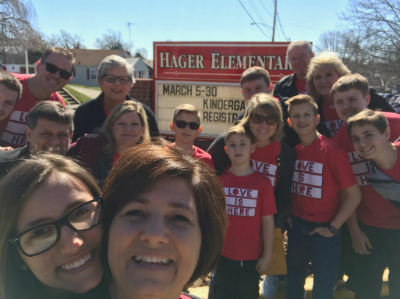 This entry was posted in All Church of God, Give Life, Southeast and tagged Ashland, community service, Easter, Kentucky, KY, Love is Here, outreach, Palm Sunday, service projects, Steve Harris, The Church Has Left the Building, Wildwood Church of God. Bookmark the permalink.